Old Bollywood movie still of the blockbuster Hindi film, Sharaabi (1984) for sale. This is an actual surviving solo Bollywood lobby card of the 1984 film that featured the greatest superstar of Indian cinema, Amitabh Bachchan in the lead role. Printed and circulated during the first release of the film (early 1980s), this original Bollywood movie still was designed and printed for publicity of the film inside a cinema hall. 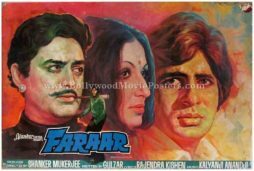 This is a rare surviving solo Amitabh Bachchan movie still was actually issued to a cinema hall that screened the film Sharaabi, making it highly collectible! Lobby cards were used as pin ups on notice boards inside the foyers of cinema halls. The corners of this rare surviving Amitabh Bachchan movie still displays visible pin holes – tell tale signs that it was pinned on the notice board of a cinema hall! 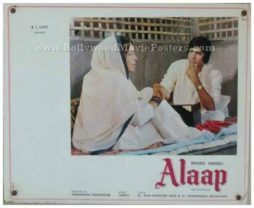 Set of three old Bollywood movie stills of the acclaimed Hindi film, Alaap (1977) for sale. 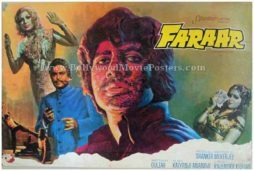 This is an actual surviving vintage Bollywood lobby cards set of the 1977 Hrishikesh Mukherjee film that featured the greatest superstar of Indian cinema, Amitabh Bachchan in the lead role. Printed and circulated during the first release of the film (late 1970s), this set of original Bollywood movie stills was designed and printed for publicity of the film inside a cinema hall. This is a rare surviving set of Amitabh Bachchan movie stills that was actually issued to a cinema hall that screened the film Alaap, making it highly collectible! Lobby cards were used as pin ups on notice boards inside the foyers of cinema halls. The corners of each of the three lobby cards are punched with ring holes to allow cinemas to pin them up on notice boards with ease. This beautiful collection of three different Amitabh Bachchan stills have been taken from key scenes and songs in the film.